Accessories (bottles etc.) shown in pictures are for illustration purposes only and are not included with the bag. This bag easily converts to a cute and stylish seat booster with a 3-point harness. It is made of a really soft and good quality material, and can be wiped clean, as well as washed. When the bag is folded, there are 3 compartments inside the bag, which can contain baby wipes, some baby food, bottle, and a beaker. 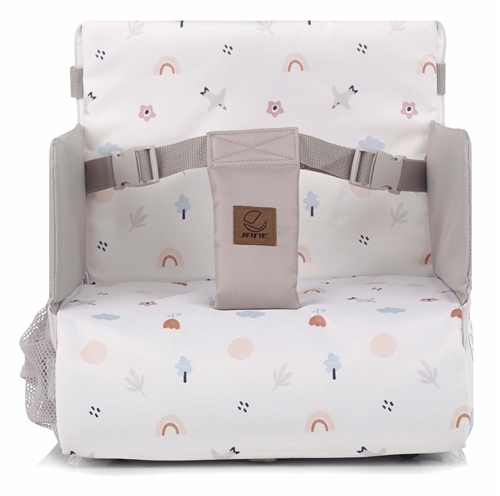 The bag itself is quite light (about 1 kg), and is really suitable for travelling and feeding on the go. This portable highchair is great to use for places like restaurants, friends and family. Makes me feel relief that my baby is safe and there is no bugs and dirt from the public highchairs. The only comment to improve this product is perhaps having a 5-point harness instead. My LO is 8 months, he seats in it happily, I would't leave him on his own though. Fantastic buy. I used it loads and always get asked by other parents in restaurants where I got this from. It's a MUST for parents who are on the move a lot.